It has been a challenging couple of years, and the reason I need to leave was inspired by this position, interestingly. When I began tweeting for TESL Ontario, I had not yet begun my Masters journey (for the second time). The interesting group of people I discovered online led me to explore a different kind of professional development. I’m becoming curiouser and curiouser about the seasoned language teacher and their professional development, centred on motivation and the use of technology, which has lead me to embark on a PhD. And I have recently noticed that I do not have the energy or the time to devote to this position anymore, not in the way I would like to. The communication and interaction which take place on Twitter have rewarded me in ways face to face professional development and relationships never could. Teachers are on this platform because we want to be here to make connections and learn; we figured out how to use it despite the lack of intuitive threading, retweeting, subtweeting, citing, and hashtagging. I have had the pleasure to work with fellow social media platform managers, past and present: @mrpottz @JessicaKWebster @Jess_icaBrown @teslchick @TamsinCobb @SumaBalagopal on the Social Content Committee. 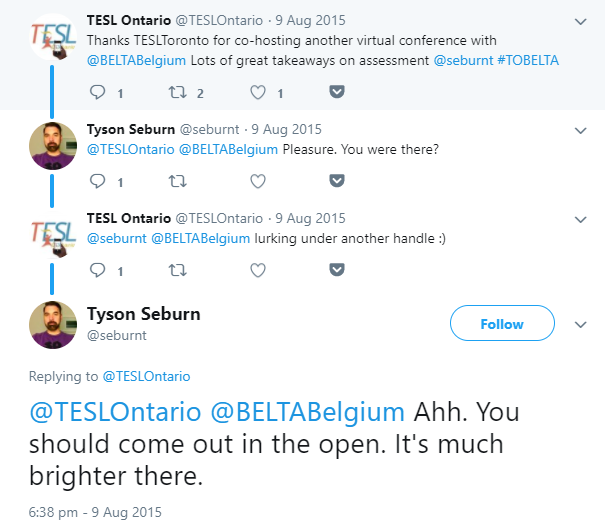 Their insight about TESL Ontario’s membership needs is impressive. Lynn Doherty and @AllieMama75 have been super chairs and members who have exhibited unrelenting support and encouraged the team’s ideas, work, concerns, and needs. 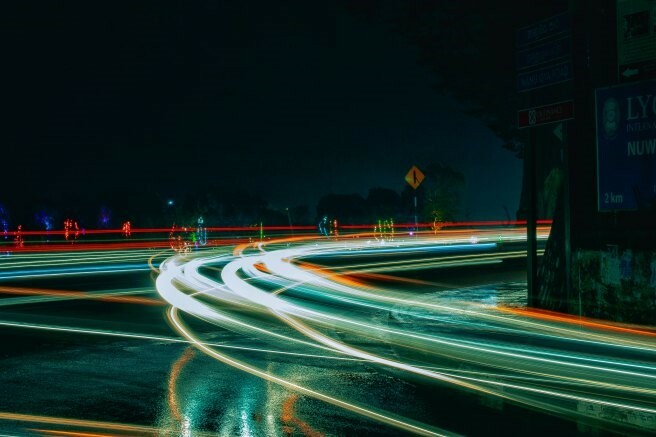 Our virtual and face to face collaborations have resulted in some meaningful initiatives that were important to the membership, if not always visible. I am now lucky to have people such as @jenartan @Francine_Bee and @NancyVanDorp as soundboards, collaborators, and friends as a direct result of this job. But that is just scratching the surface. sharing information with and from TESL affiliates. 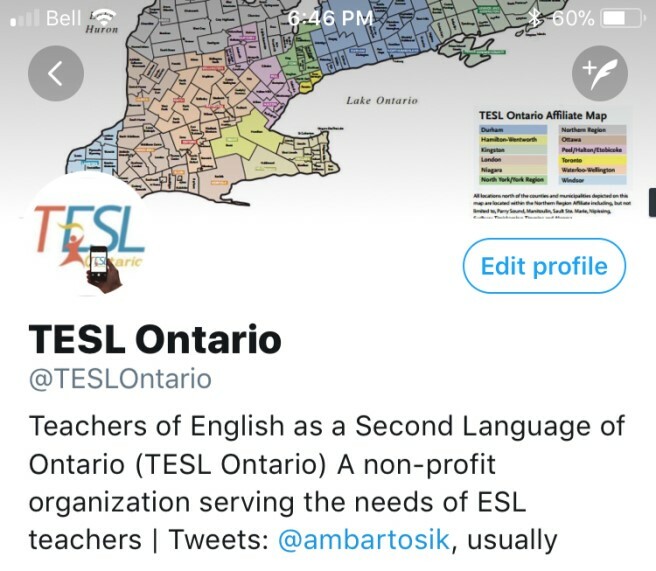 I thought my job was to be invisible and represent TESL Ontario as their official voice. I wasn’t prepared to be challenged on my approach. 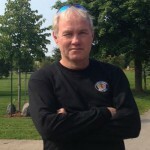 Created and delivered a series of 3 webinars for TESL Ontario about how to use Twitter. I am grateful for the opportunities this volunteer position has provided me and it is my genuine wish that my successor has as many achievements as I have, and makes this position uniquely theirs. Thank you for having me for three years. Anna, you certainly have left the social media arm of TESL Ontario a stronger, more engaging and more human resource through your efforts. I hope that your openness to collaboration with others continues in your wake. All the best on your present and future adventures. Anna, you will be missed! But, like you said, it’s now time to pass the baton and have your successor have as many accomplishments! Congratulations on your work ethic, dedication and great sense of humour! 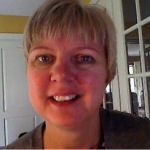 Anna, your contributions to the TESL Ontario Social Content Committee and our online community have been exceptional and invaluable! Your enthusiasm and dedication to the role was inspiring. You will be missed! I’ve always enjoyed your special way of bringing people and issues together on Twitter, Anna. You’ve certainly left your positive mark in this role. Thank you for undertaking it for 3 years with such zest! I’ve always enjoyed your keen comments and strong enthusiasm.